Ready to Try Some Ponzu Dressing ? Make a delicious salad with Ponzu sauce or use it as a dipping sauce or a dressing. Or just add it to any dish for more flavor. Ponzu is a popular and widespread sauce in Japan. It combines soy sauce, dashi (fish soup stock) and a Japanese citrus. It also often includes a little bit of vinegar or mirin. 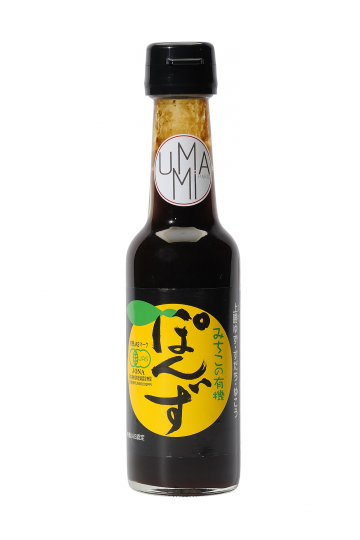 Its taste is very much appreciated as it is both fresh and deep and rich in umami. You can make a salad and use cherry tomatoes, green salad, avocado, cucumbers, radish, daikon, fresh seaweed, mango, fruits, shiso, basil, and whatever vegetables and herbs you like. You can add chicken, tofu, tuna fish, scallops, meat, or what every you feel like. We also use it as a dipping sauce for hotpot dishes or shabu shabu etc. There are No specific rules on how you like to use it. Take a taste and let your imagination take you to enjoy a meal. We have this at our store so please feel free to stop by and try to add it to your list condiment list. For us, it is just as a important to keep in the fridge next to soy sauce.